Antique carved Italian marble sculpture display pedestal features Corinthian column-form with stepped base and capital, circa 1890. Measures: 47.5" H x 12" x 12" overall; 12" x 12" top display. 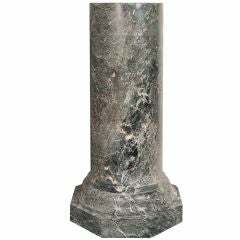 A statuesque pedestal in a column form made from Verde Alpi marble with beautiful white and rust veining throughout. Italian, circa 1940. 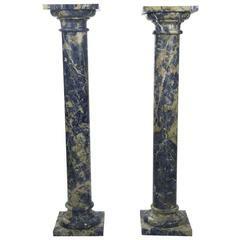 Decorative pair of lapis pedestal columns with lapis top and base. Italy, 19th century. Some chipping and signs of repair. 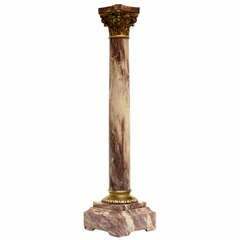 A marble column (pedestal) with a bronze Corinthian capital. Height 118 cm. Width 30 cm.